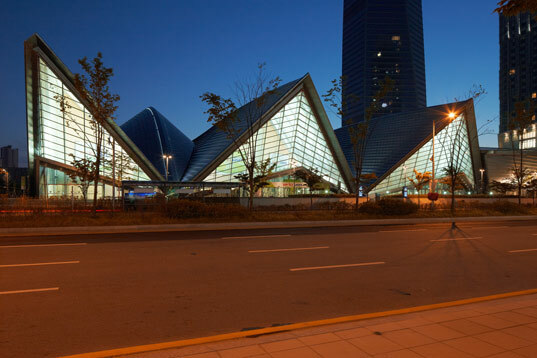 We first wrote about Korea’s Songdo IBD back in September, and now we’re thrilled to report that the U.S. Green Building Council (USGBC) has just awarded the ambitious eco-city’s convention center a LEED NC 2.2 “Certified” rating, making it the first LEED-certified convention facility in Asia! Called Songdo Convensia and designed by Kohn Pedersen Fox, the beautiful undulating structure walks the green walk as much as it talks the green talk. 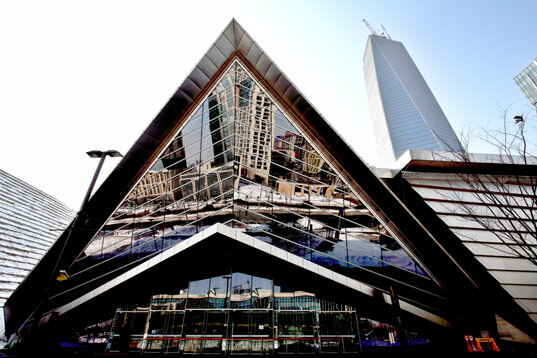 The Songdo Convensia Center was completed in 2008 and features extensive access to public transportation, 230 bicycle racks for citizen and worker use, shower facilities for employees who commute to work via bicycle or walking and preferred parking for fuel-efficient, low-emitting, and carpool vehicles. It also incorporates a versatile, energy-saving lighting system, landscape design that does not require irrigation, a 45% water demand reduction in plumbing fixtures each year and low-VOC finishes to promote healthy indoor air quality for visitors and employees. During construction over 80% of construction waste was recycled or diverted from landfills and incinerators, and locally-sourced and recycled-content materials were used to reduce waste. Its too bad LEED calls this development which fills tidal flats and wetland ecosystems and destroys foraging area of the endangered Platalea minor "Sustainable." We first wrote about Korea's Songdo IBD back in September, and now we're thrilled to report that the U.S. Green Building Council (USGBC) has just awarded the ambitious eco-city's convention center a LEED NC 2.2 “Certified” rating, making it the first LEED-certified convention facility in Asia! Called Songdo Convensia and designed by Kohn Pedersen Fox, the beautiful undulating structure walks the green walk as much as it talks the green talk.